First and foremost, the East Coast has great skiing, from Stowe in Vermont, to Sugarloaf in Maine, all the way up to Tremblant in Quebec. But the reality is that the conditions vary considerably from places like Colorado and Utah: you get fewer powder days, more hardpack, and those unfortunate icy stretches between snowfalls. Skis have gotten wider overall, but remaining on the narrower end of the width spectrum remains the best choice. We feel that the ideal East Coast all-mountain ski is between 80 millimeters and 90 millimeters at the waist. Below are 7 great ski models for East Coast conditions for men and women for the 2018-2019 season. For more information on choosing the right ski, see our comparison table and buying advice below the picks. What we like: A superb East Coast all-rounder. What we don’t: Hard chargers may prefer the Brahma below. Rossignol really hit it out of the park with the new Experience 88 Ti, a do-all ski that can take on the entire mountain and has the ideal build for East Coast conditions. First, it’s a great 88 millimeter-width carving ski, with easy turn initiation and edge-to-edge quickness. Second, it's decently playful thanks to a light but sturdy metal laminate and Rossignol’s Air Tip Technology that reduces weight with its honeycomb-style design. But perhaps most surprisingly, the Experience 88 provides better float in powder than you might think for a ski of its width. The Experience 88's versatile nature means that it can handle all the hardpack days you can throw it plus a few inches of new snow when necessary. And you don’t have to think twice about bringing it on a resort trip out West (just as long as you’re not venturing too far into deep powder). Our only hesitation is for the hard charger that wants something a little more substantial underfoot. For those skiers, we recommend trying the Blizzard Brahma below. What we like: The best overall groomer ski on this list. What we don’t: Not as playful as the Rossignol Experience above. In creating the Brahma, Blizzard took the technology and design of its popular 100-millimeter Bonafide and trimmed it down to a more East Coast-centric 88-millimeter waist. Flipcore Technology really keeps chatter to a minimum, and the addition of carbon for last year and a tighter turn radius this season makes the Brahma a wonderful carving ski that can handle speed well without being as stiff as a racing model (it's still pretty stiff, though). What type of terrain does the Brahma handle best? Groomers and hardpack are its specialties, but performance isn’t quite as impressive on moguls and in deeper snow. The stiff construction also requires a confident skier at the helm to get the best from these planks. It all adds up to a high-performance option for advanced skiers who prefer to stay on piste and don’t need a ton of playfulness for dodging trees and hitting jumps. What we like: One of the most versatile skis on this list. What we don’t: On the wide side for icy conditions. Stepping up to 90 millimeters underfoot, the Volkl Kendo is a highly versatile all-mountain ski at a good price. It’s narrow enough to carve well—although it prefers wider turns—and take on groomed runs at a variety of speeds, but wide enough to handle powder days better than any other models on this list. Past versions of the Kendo have been criticized for being too stiff for intermediate riders, but Volkl has loosened things up by taking the waist out a millimeter, and added some rocker in the tail for better float. If you live in Vermont near some of the snow-heavy East Coast resorts or put in a ton of days each year, the Kendo is one of only a few skis that can take you all over the mountain. If you want something more playful, however, the two sheets of metal and wider turn radius make the Kendo a little less fun in tight spaces. What we like: A fun and playful on-piste option. What we don’t: Narrow for soft snow. With an 80-millimeter waist, the Nordica Navigator 80 is the narrowest ski to make our list. And while its design limits top-end stability and sidecountry prowess, its playful nature makes it a great pairing for progressing intermediates. With a trim shape and less metal in the construction, the Navigator is flickable and does well with short to medium turns. It’s not meant for long and fast sweepers like the Kendo above, but the Navigator does feel much more comfortable at speed than the budget-friendly Vantage 86 below. As expected, the Navigator 80’s greatest weakness is soft snow. While it’s easy to handle, you’ll just want more ski for all-mountain use. This slight drop in overall performance pushes it down our list, but we do like the price at $400. For a more serious option from Nordica, check out their coast-to-coast capable Enforcer 93, which topped our all-mountain ski list for this season. What we like: Good performance across the board. What we don’t: Falls a little short on edge hold. The Armada Invictus 89 Ti is a serious contender for all-around East Coast use. What’s most impressive is its playful nature despite an on-piste, traditional construction. The Invictus 89 Ti has two layers of metal and full camber underfoot, but a small amount of rocker and a wide shovel in the front deliver solid performance in variable snow. It’s a ski that likes to get off trail and into the trees but will still feel planted on the groomers. Why the Invictus is mid-pack on our list is its edge hold relative to our top-rated options. In short, it favors fun over all-out performance. But what the Invictus gives up to the Rossi Experience or Blizzard Brahma at the limit, it makes up for in off-trail versatility. If this article were instead about the best East Coast all-mountain skis, the Invictus would find itself at or near the top. What we don’t: You may grow out of it. Moving down slightly in waist width to 86 millimeters, the Vantage 86 from Atomic is a first-rate all-mountain ski in its price range that is great for East Coast conditions. Atomic lists the Vantage as being easy to handle, which means that turn initiation and edge hold are well suited for those still learning the tricks of the trade. This ski isn’t super playful for moguls and lacks stiffness for connecting fast-paced GS turns, but it will perform well cruising groomed runs and even provides decent float in fresh snow. Perhaps what we like most is the Vantage 86's price point, which is $250 to $300 cheaper than the top picks above but still works well for weekend warriors. If you’re a beginner or intermediate rider and not up for spending $650 on a ski this year, the Vantage 86 is a nice choice. What we like: Fast, smooth, and incredibly capable. What we don’t: Non-experts need not apply. For ex-racers and people who only buy the best, the Kastle MX84 is the finest all-mountain hardpack ski on the market. With a wood core, two layers of titanium, and a traditional straight camber profile—none of that fancy modern rocker needed here—the MX84 is built for carving at fast speeds. In many ways, it takes a number of the positive characteristics of a racing ski but at a manageable 84-millimeter waist width. Again, this model is recommended for experts who ski aggressively and will appreciate its abilities, but you won’t find a better hardpack ski. In terms of powder, you can take the MX84 off piste and it will greatly outperform its relatively narrow specs, but its stiff construction requires a strong pilot. Why isn’t the MX84 isn’t higher on this list? The price is simply too far out of reach for most people, and some question whether it’s actually twice as good as the competition to merit being double the price. We agree that it’s hard to justify the expense, but for top-of-the-line performance there’s just nothing better. What Makes a Ski Ideal for the East Coast? As you can see, Vermont has snowfall that actually is competitive with Colorado but less than Utah or the Pacific Northwest. Maine, New Hampshire, and New York lag behind in snowfall but still are respectable at around 200 inches. However, all snow is not created equal. The humidity and lack of sunshine on the East Coast lead to more hardpack and fewer true powder days. The resorts also have less vertical rise and the mountains don’t offer as much alpine terrain, meaning that you will be skiing groomed runs and off-piste skiing is more rare. Downhill skis have three common points of measurement: at the tip (the shovel or most often the widest part of the ski), the middle (waist), and the bottom (tail). Ski dimensions are measured in millimeters and often include three numbers in the following format: 127-88-117 (tip-waist-tail) for the Rossignol Experience 88 Ti. The most important number for the majority of skiers is the middle number, also referred to as waist or width underfoot, and this what many people use to analyze ski width. Skis have gotten progressively wider over the years as industry technology has evolved. An East Coast skier 10 or 15 years ago may have been looking at a 70-millimeter ski, but the ideal range is now comfortably at 80 millimeters or more. In terms of waist width, the optimal East Coast ski is between 80 millimeters and 90 millimeters, which should provide stability and good carving on groomed runs and decent flotation in deeper snow. Beginners and true intermediates can look toward the lower part of the range, and more advanced skiers will appreciate the added width with an 88 millimeter or 90 millimeter ski. Carving is the name of the game on the East Coast, so you need a ski that can initiate turns, hold its edges, and is stable. The good news is that it’s actually simpler for East Coasters to choose a ski than it is for West Coasters, who need a ski that can both carve and float in powder. Choosing the right waist width is the place to start, which helps to ensure that you won’t end up with a ski that is too heavy and arduous to turn. The evolution in ski profiles, and specifically the jump from simple camber to today’s rocker/camber hybrid, has allowed fatter skis to carve more easily on groomed runs and reduced their tendency to catch edges. Most manufacturers have proprietary technologies of different names for the cores and edge systems of their skis, but all of the 80 millimeter to 90 millimeter skis on this list are tuned for carving and turn initiation primarily on hardpack. Skis that fall in the 100-millimeter width range and above will have more powder-centric tendencies and their performance on groomers will be compromised. One of the major differences between beginner skis and intermediate/advanced skis is the complexity and materials of the core. Simply put, cheaper skis are designed for those traveling at slower speeds as they learn the ropes, but their comfort level deteriorates as the pace picks up. This is in part due to a softer flexing core that errs on the side of being forgiving rather than all-out performance. Chatter is a common term in the ski world, which occurs when you are not maintaining a sufficient edge or hold on the snow or the tips and tails start vibrating at speed. When you move too quickly with a beginner ski, the chatter kicks up significantly and you lose connectedness to the snow surface. The Kastle MX84 at the bottom of this list is built specifically for skiing fast on hardpack with high-end materials and a relatively complex core construction designed to maintain edge control and minimize chatter. The top three skis on this list—the Rossignol Experience 88 Ti, Blizzard Brahma, and Volkl Kendo—also excel in this category but not quite as much. One shortcoming of choosing the cheaper Atomic Vantage 86 is that you will notice more chatter and a looser feel at high speeds (although not nearly as much as a true beginner ski). The good news is that all seven of the skis above are designed for hardpack and will perform admirably on ice for their price range. One upside of being an East Coaster is that if you advance your skills and start traveling to ski, building your quiver is a very logical process. If you start with one of the East Coast skis above, then you’ve already got yourself a great ski for groomed runs and hardpack. If you end up heading out to Colorado or Utah for a ski trip, you can add a more powder-oriented ski in the 105-millimeter waist range for when the conditions are right. West Coast skiers, on the other hand, often are searching for that elusive quiver-of-one ski that is extremely difficult to pin down (we cover a number of good options in our all-moutain ski article). They can buy a 100 millimeter ski, for example, that performs well in the sidecountry and backside of the hill but won’t handle groomers nearly as well as your 88 millimeter or 90 millimeter ski. And their 100 millimeter model won’t ski powder as well as your soft-snow focused 105 millimeter or more ski either. 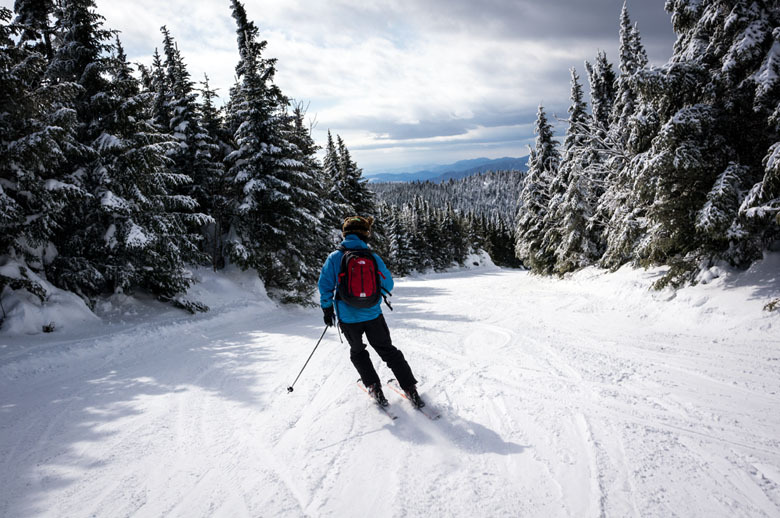 The lesson is that although the East Coast may not have the best conditions in North America, the more predictable terrain and snow type makes it easier to choose your ideal ski.